Ever seen pictures of these home computers decked out with LEDs and plexiglass? Well, I have all the pc gamers beat now. 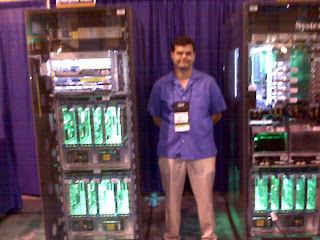 This is IBM's new Z10 mainframe taken this week at the Rational Software Developer's Conference in Orlando. This is a lower end unit and only has one CPU card in it. That is the rack to the right in the top area, which also includes memory stacks. The refrigerant cooling unit is the middle of the right rack with fan units covering the CPU card. 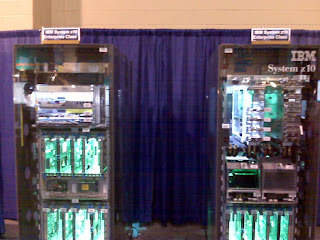 The left rack is for I/O cards and units such as 10Gb ethernet cards, FiberChannel cards, etc. The top left area is the backup battery pack. I can't remember all the details and all the parts - some are unique to the mainframe. The mainframe guy said that with this unit IBM is starting to get traction into customers that never had big iron before. He mentioned a client that consolidated over 200 Linux machines onto one of these units with zLinux (a Red Hat derivative). While the acquisition costs must be significant, imagine how much floor space got freed up. Think about the power and cooling cost savings. Must be substantial. So, I wonder what kind of frame rates you could get with this beast? Anyone up for Quake?